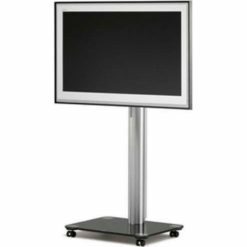 In every situation, Spectral’s Floor range is an ideal stand for mounting Plasma, LCD or LED screens where space is at a premium. 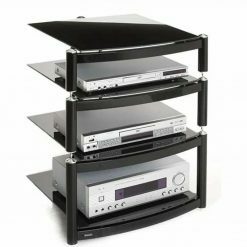 It is a silver square bracket mount with wheels and storage tall corner display for consoles and components in the bedroom, living room or lounge. 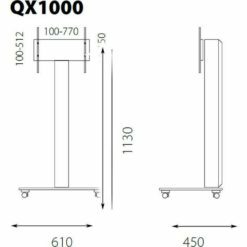 Whether in the bedroom, hotel suite or conference room, this unit provides a stylish, sturdy and stunning flatscreen trolley suitable for any environment with any interior design. The simple design belies the robustness of the stand. The simple glass and aluminium construction is designed to take a screen of up to 42″, offering 90ÃƒÆ’Ã†â€™ÃƒÆ’Ã¢â‚¬Å¡Ãƒâ€šÃ‚Â° of rotation from left to right. Integrated cable management ensures that any wires are kept neat, tidy and out of the way.